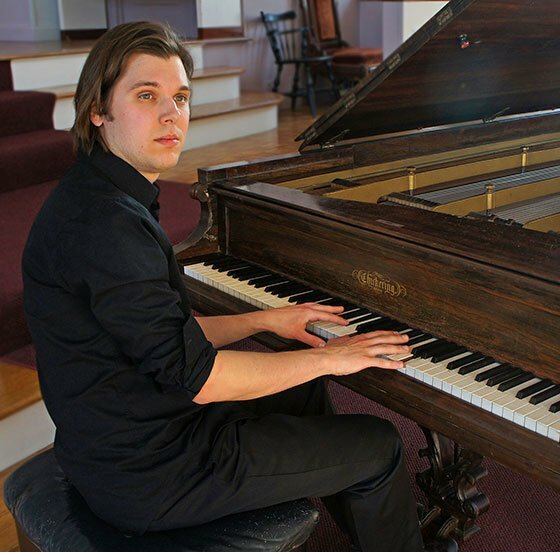 It’s a bit unusual for BMInt to be reviewing recordings, but in this case, pianist Artem Belogurov’s Piano Classics CD “American Romantics: The Boston Scene” is the outgrowth of a project (detailed here) whose latest phase was Belogurov’s recital last night at St. John’s Episcopal Church in Charlestown (not to be confused with the church of the same name in Jamaica Plain that often serves as a concert venue). The CD, not yet available on the usual online purchase and download sources, has already been pegged as the “CD of the Week” by the Austrian station Radio Stephansdom. We found the contrasts between it and Belogurov’s live performance interesting. The subject matter for the CD and the recital is the repertoire of character pieces and other “salon” music (not in the pejorative sense often applied to the term, since much of Schubert, Chopin, Mendelssohn, Schumann and even Brahms fits the category, but only in the sense of being intended for home performance) by the “Boston School” or “Second New England School” from the late 19th and early 20th centuries. Belogurov’s repertoire ranges from the relatively famous (John Knowles Paine, Arthur Foote and George Whitefield Chadwick) to the once-famous (Ethelbert Nevin, the only one of the group not born in New England and the only one honored with a postage stamp), to the truly obscure (Arthur Whiting and Margaret Ruthven Lang). The earliest work represented is Paine’s “In the Country” suite from 1873 and the latest (not counting Foote’s 1915 revisions) is Chadwick’s 1905 “Five Pieces.” While a few of the works make gestures towards abstraction (Foote’s Suite No. 1 in D minor, Whiting’s Bagatelles, and Lang’s Rhapsody in E minor), most of them are little sound-pictures. It should be clear from the foregoing that the artistic aims of this music are not the same as what these composers would seek with larger abstract works (Paine wrote “In the Country” at about the time he was writing his First Symphony, which knocked the socks off a whole generation of American composers). The objective is to present ideas succinctly and evocatively. The technical constraints imposed by the intended audience also tended to keep the harmonic ambitions of these pieces fairly limited, though the pieces from Chadwick’s set (on the CD Belogurov performs the barcarolle “In the canoe” and the humoresque “The frogs,” while on the recital he substituted the “joyous prelude in C” for the latter) are more harmonically adventurous, showing an appreciation for Debussy and Franck. Another interesting feature of these pieces is that, while some of their titles indicate a willingness to look at the environment around them, the composers largely avoided any local color in the music, lending the works a generic quality. One exception is Paine’s fugue on a little baseball ditty, “Over the wall is out, boys,” which has a cheeky upthrust at the end of the tune. On the other hand, in “In the Country,” there is a shepherd’s lament—and where, exactly, would he have seen sheep and shepherds in New England? Musically, though, there are little gems scattered throughout these numbers. In the same Paine suite there is “The Mill,” a number with a wonderful turning, grinding left-hand figure that sets the image in an instant, and Chadwick’s canoe is a far steadier vessel than what appear in most barcarolles you’ll hear—it glides smoothly across the lake. Belogurov, in person and on disc, is alert to these ear-catching tidbits and brings them out whenever possible. In the live concert, he was occasionally too anxious to make concert pieces of them, with the usual result of pushing the tempo for virtuosic effect; but that’s not what these pieces are about. Of the abstract music in the mix, Foote’s suite is a bit of a mix—a prelude and fugue reminiscent of Schumann’s attempts to emulate Bach, which are followed by a romance that is no better than okay—more Mendelssohn than Chopin—and a capriccio that seems to have been the beneficiary of his later revisions, as it’s much more musically forward, while its rhythms trip lightly. The three of six pieces comprising Whiting’s set, Caprice, Humoreske (one gets giddy with the gallimaufry of foreign languages in which American composers cast their titles) and Bagatelle, were, in turn, more capricious than Foote’s entry, robustly though decorously humorous (with a thoughtful middle section), and not so memorable. The sleeper in the group was Lang’s 1895 rhapsody, which begins sternly with an interesting articulated melody that she transforms in the second half to a sweetly gentle caress. It was the most musically ambitious piece on the program (and recording), but in the end succumbs to the limited technical means she deployed for it. Belogurov made up for this with a sympathetic and nuanced performance. 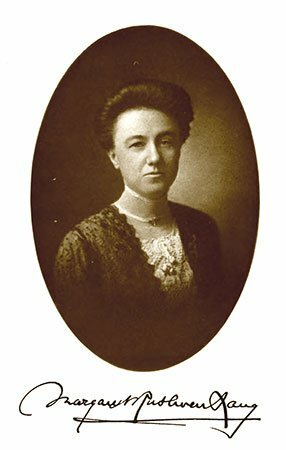 Lang, an exact contemporary of Amy Beach, was the first female composer to have a work performed by the Boston Symphony, but she destroyed most of her larger works in a fit of self-criticism, then fell creatively silent after 1919 (she died in 1972, at age 104). The principal difference in program between the CD and the recital, apart from the substituted Chadwick piece, was the omission on the recital of Nevin’s “Water Scenes,” op. 13, also from 1895. These are mostly delicate and ephemeral, with the key exception of “Narcissus,” which skyrocketed to the top of the fin-de-siècle charts and probably contributed more than anything else to Nevin’s postal honor. It’s a piece everyone knows even if you don’t know what it is and who wrote it, and Belogurov obliged by playing it as his encore on Saturday, needless to say much better than the linked video (though with equivalent briskness of tempo—some interpreters take “andante con moto” to mean “largo lugubre”). The CD was recorded in July 2013 in the same venue as the recital, on its well-kept 1873 Chickering, a quite appropriate instrument for the repertoire. The nearly nine-foot straight-strung concert model responded with sweet tones to the expertise in phrasing, dynamics and pedaling which Belogurov, an aficionado of historic instruments, displayed throughout. The small church with seating for perhaps 300, a high ceiling with timber trusses, and flat plastered walls, produces a lot of reverb. The CD, engineered by occasional BMInt contributor Christopher Greenleaf, tries to clean this up somewhat, but retains a sense of its being performed in a hall. To our ears, it would have been better for this music to have more tightly constricted the recording sonically, to provide greater intimacy. Still, for those curious about this corner of piano literature, it’s worth seeking out, and it’s worth looking out for future occasions on which Belogurov features it on his programs.